For as long as I can remember playing in water has always been a favorite activity of my kids. 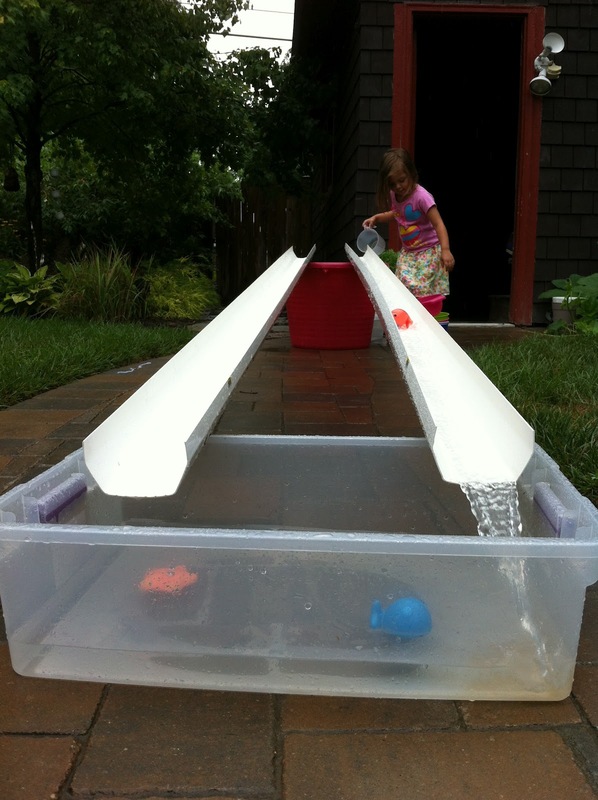 So when I saw this cool idea for water play using gutters from Play at Home Mom I knew we would have to give it a try. We purchased two 10 ft gutters at the home improvement store. I then found a large rubber bucket and a small plastic tub that we had at our house. We rested one end of the gutter on the big bucket and the other on the small tub which seemed to hold the gutters pretty steady. I filled the bucket up with water from the hose and the girls helped me collect a bunch of water squirtes and rubber duckies that we use in the bath. 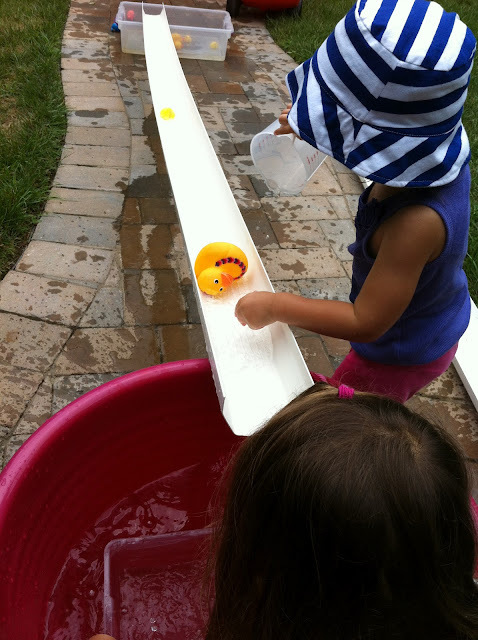 Then using plastic cups the girls scooped the water and used it to move the ducks down the gutters. We have played with the gutters a few times, every time they have loved watching the ducks go down, giggling when they get to the end and fall into the tub. They of course get soaked, which is part of the fun and has made this a great summer activity. Although I am thinking as the weather gets cooler it might be fun to play with balls or even sand in the gutters. Has anyone else tried those? Or have any other ideas for fun things to try? We do this too. We also have some smaller lengths and the children like to join them and change directions, it's great problem solving to get the water flowing from one into the other without losing too much. We usually put a builders Tuff Spot at the bottom because it's lower. The balls you get in ball pools work well too. We also use our guttering for toy cars along with cardboard boxes and small planks of wood or building garages, bridges, ramps and roads. That was a great idea to make a slide out of gutters. I think one good lesson kids can learn from this is that keeping a gutter clean and debris-free can help the water run more freely, which you can use as an example on the importance of keeping their belongings clean. This is a fun and easy idea! The gutters could be used to roll balls on cold days as well. This post is so interesting. I am a regular reader of your blog thanks for sharing with us this post. I had fun while reading this post. 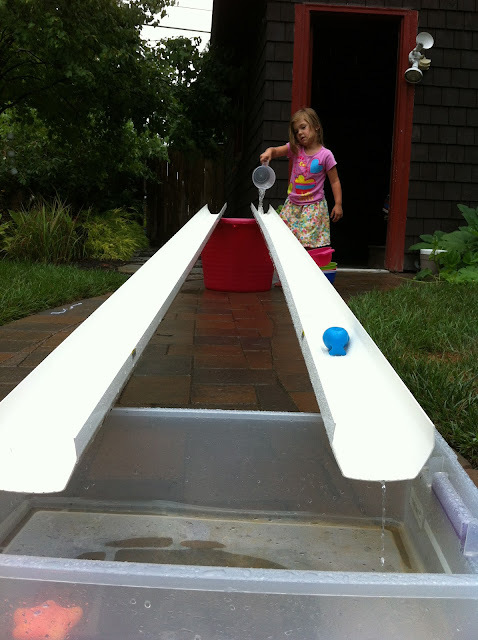 Good idea for child fun with gutters... We make many type of fun activities with rain gutter like hanging gutters in children rooms for storing books and toys etc. Thanks for this post and idea. I love it when i see people use spare material for creative projects. This is great!